The MVP program is a little unusual. Members are rewarded for what they've already done, and get all the benefits for a membership year even if they do nothing further. Of course, most of us just keep right on doing what we're doing and get awarded for multiple years. Do we do it for the benefits? Probably not. Most of us like doing community "stuff" whether that's speaking, writing, forums, blogging, or whatnot. But the benefits matter - they actually enable us to do the community stuff. We get extra information in the form of access to betas or conversations with product groups. We get access to each other, a treasure trove of information. And we get recognition, which can open doors for speaker selection folks, article selection folks, and so on. I also know as someone who regularly hires developers that "Microsoft MVP" on a resume makes a huge difference for me. Now my MVP lead, Sasha, has written a pair of articles that summarizes many important things about the program. Part 1 calls us super heroes and Oscar winners (blush) and has some useful links. Part 2 goes into the benefits a bit. Of course many people want to know how to become an MVP. It's a bit like how to get to Carnegie Hall... practise practise practise. Do the community stuff every chance you get, throw yourself into sharing your knowledge, and when you've been doing it for a while and you know an MVP or two, ask one of them if you think you're at that level yet. If they say yes, ask if they're willing to nominate you. If you think you're really active in the community, but not a single MVP knows you and knows what you've been up to, you haven't been active enough yet. People who don't actively share their knowledge often underestimate what "active" means. Even if you're not nominated or awarded, I am confident that the community work you do will be its own reward. Approach it like that rather than to earn an award, and you're sure to be happy. The Code7 contest - How to get a trip to PDC and $17,777. Not bad eh? Also covered by Yochay. XP2Win7 (aka PhotoView) - I've covered it before and I won't repeat the links from that post. Scott includes a gratuitous underwear shot you're going to love. Code Pack - you know it almost deserves its own category here on my blog. Like Scott says, a gold mine of samples in both C# and VB. 16 bonus links and the "lightweight" parameter for MSDN. What are you waiting for? You need to read Scott's post. As you probably know, we're on our way to a new version of the .NET Framework. There's so much that is new in it you could hardly know where to start. I'm just letting the information wash over me in other people's blogs, and trying things out with the beta from time to time. I spotted two related things in the last little while. First was Improvements to Interop Marshaling in V4: IL Stubs Everywhere on the CLR team blog. The takeaways here are faster performance, consistency between the 32 and 64 bit worlds, and better debugging. Since there is still a lot of native code hiding underneath your managed calls to library functions, everyone cares about the faster performance aspect. Read the post for all the details if interop matters to you the way it matters to me. Second was COM Interop Gets Much Better in C# 4.0 on DevX. I've always avoided C# for COM interop work because it doesn't do optional parameters, and most COM work is rich in them, especially working with Office, which I used to do quite a lot of. Less casting, no need for PIAs, no more fake values called "missing" or some variant thereof ... it's all good. And here again the magic words "improved performance". Two small things to note with a non-small impact on your life as a developer. Alan Skorkin reminds us that much of what drives current software development process came from the more general study of process for all kinds of work, including manufacturing. When you decide to adopt a particular process, you do so to reach a goal and for that vast majority of businesses, that goal is productivity - more profit per time period. (For a few very small operations, less time period to earn the profit / income sounds far more humane, but is still based on a desire for higher productivity.) Whenever you adopt a process instead of just telling your staff to do whatever you want, it's because you don't think they would be as productive left to their own devices as they would be under the direction of the process. As Alan points out, there are two very different thoughts behind this basic position. One says that workers are lazy and shiftless. They'd rather chitchat, smoke, or daydream than produce what management wants them to produce. Processes built on this thought are all about measuring and controlling and proving that people have or haven't done what they should have done. The second, christened Theory Y in contrast to the first, which got dubbed Theory X in order to tell the two apart, says that workers are much happier when they know they are productive, and need management to help them achieve productivity as a co-operative goal. Processes built on this thought are full of collaborative work and empowering and the like. He goes on to draw some specific conclusions about Lean that I will leave aside. I think it's useful to look at the process you work with day to day and ask yourself - is this process founded on Theory X or Theory Y? What image does the management at your firm have of the workers at your firm? Does process control them or support them? Is the motivation for workers assumed to come from inside themselves, or to be imposed by management? No matter what management says about what developers can and can't do, the process you work with will tell you their founding principle. It might be an eye opener to think about it like that. What are the travel restrictions doing to the new way of working? It wasn't long ago everyone was talking about a whole new way of working. It started with telecommuting in the 90's, but spread in this century to something far bigger. Remote work as a way of life, virtual teams, outsourcing, offshoring ... the scale just kept growing and the savings for companies appeared to be at least partly met by happy staff, whether that was a guy in the city who didn't have to spend 90 minutes each way in traffic, or a guy who was able to keep living in his small town while working for the big city firm so far away, or even a guy in a developing country who was able to earn more than his neighbours and follow the lure of high tech and problem solving at a time when no firms in that country were offering those jobs. I know many people in the big cities and the developed countries lost their jobs to those people, and I know it wasn't always simple to find traditional employment once the world of work started to change. Still, the world and the way many people in it earn a living changed and will not be changing back. That said, in the mid 90s everyone I knew who was associated with any of this "new way of working" had come to realize it wasn't just a fire and forget sort of thing. You had to communicate a lot. And while technology made some ways of communication simple and cheap, so that video calls and conference calls and instant messenger and desktop sharing and so on are all vital, it couldn't do it all. You have to get face to face still, and you have to do it regularly. I recently finished a 10 month contract for clients three thousand miles away. I did the vast majority of the work from here, and had phone calls and livemeetings many times a week. But every 4 to 6 weeks I got on a plane and I went there. And wow, the work we got done in those few days! Mini hallway meetings, lunches, dinners -- I typically could "touch" half the project participants in just two or three days, and solve seemingly intractable problems by going to people's offices and listening to them and looking at their body language and telling them they could trust me or asking them what the real problem was. It made such a huge difference to the success of the project. I didn't get paid for the time I spent travelling to them, or the nights spent away from my family, but I gladly invested that time to make everything go smoothly and to be a successful remote worker. Some other folks have noticed this too, and in a far more systematic way. How's this for a conclusion: "... common workplace-relationship problems, such as broken commitments, mistrust and misrepresentation of information, occur more than twice as often with virtual teams, as opposed to teams located in the same building. " Yikes! Apparently it's partly because things we do when we're upset with people work well if you see if each other regularly, but make things worse if you're apart. Or this useful summary: "teams are a lot more effective when they're working with their friends in another country than when they're working with those stupid offshore idiots who never understand our designs or requirements." So in that context, what could be a worse way of saving money than lowering the travel budget to zero and not letting people visit each other any more? Yet that is exactly what's happening in a lot of companies. If it's happening in yours, do something about it. You need to visit your colleagues. If not, when your projects go pear-shaped, you may find the whole concept of virtual teams gets thrown out with it. And that would be a real shame. 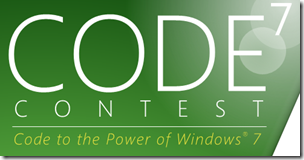 Accessing new Windows 7 or Vista features is a challenge from managed (.NET) code. The level of interoperability required is out of reach for many developers. The Windows API Code Pack for the Microsoft .NET Framework is a sample library you can use in your own projects today that provides access to new user interface features (taskbar jumplists, libraries, sensor platform and more) as well as "behind the scenes" features that make your applications more aware and responsive (restart and recovery, power management, and more.) Discover a shortcut to Windows 7 and Vista development for Microsoft Visual Basic and Visual C# programmers and how you can get involved. Now comes the logistics fluffle of getting everything booked, telling "my" teams I'm going, and possibly picking up some other talks or panels or whatnot while I'm there. I'm looking forward to it already! I love Tech Ed Europe - it's such a well run show and the other speakers are a delight to spend time with and learn from. The energy is always good and on top of that the destination is fabulous. I adored Barcelona, so now it is time for Berlin to show me what she's got. What a week we've picked to be there! You can still register at a discount. See you there! I've done several Tech Ed talks, in Europe and the US, in which I've demoed lambda expressions, a new language feature coming in C++0x and implemented in Visual Studio 2010. If you missed your chance last year to watch my Tech Ed Europe talk, it's still available on page 3 of the "last year's highlight's" page. But that's 80 minutes and covers more than just lambdas. If you would be up for investing a tenth of that time, try this Channel 9 piece featuring Thomas Petchel. He's obviously VERY familiar with the STL and he illustrates perfectly how writing dinky little functions to initialize arrays can be tedious and time consuming, and how lambdas make them faster. If you watch that and like what you see, go ahead and give my Tech Ed talk a listen as well.